Star Swamp Bushland is a 96 hectare conservation reserve 15 km north of Perth, Western Australia. The Reserve is a declared Bush Forever site [no. 204] and comprises a 4 hectare seasonal freshwater lake with paperbark trees and 92 hectares of Banksia, Tuart, Jarrah and Marri woodlands, and areas of low heath. The bushland provides a breeding site and sanctuary for both waterbirds and other bushland bird species and over 65 species of birds have been recorded. It is also an important habitat for many species of reptiles, insects, and spiders. The main flowering period is between August and October, but there are some flowers to be found at any time of the year. 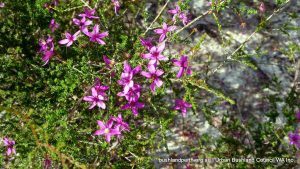 Over a dozen species of orchids occur in the bushland and several hundred flora species have been listed. Star Swamp Bushland is an A-Class reserve, vested in, and managed on behalf of the community, by the City of Stirling. The Reserve has been set aside for the purposes of conservation, passive recreation and education. Star Swamp is an Urban Treasure.